This smoked chicken is made with a whole bird that’s either brined or massaged with a marvelous dry rub and is slowly cooked in a smoker or the grill. Easy entertaining. 1. Pat the chicken dry, inside and out, with paper towels. In a stock pot, bring the water and dry rub to a boil, stirring until the sugar and salt are dissolved. Let the brine cool to room temperature, then transfer to a nonreactive container and refrigerate until chilled. Add the chicken to the cold brine and refrigerate for 4 to 8 hours. Place a wire rack on a rimmed baking sheet. Remove the chicken from the brine, pat it dry with paper towels, and place it on the wire rack. Refrigerate, uncovered, for 6 hours. Discard the brine. 3. 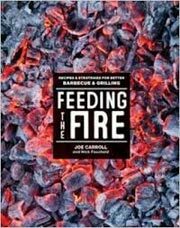 Preheat a smoker to 225°F (107°C) or set up a grill for smoking. 4. Place the chicken in the smoker and let it do its thing, maintaining a smoker temperature between 200°F and 225°F (93°C and 107°C) and replenishing the wood chunks or chips as needed, until an instant-read thermometer inserted into the center of a chicken leg registers 165°F (74°C). The total smoking time should be between 3 and 5 hours. Transfer the chicken to a cutting board and let it rest for at least 10 minutes. 5. At this point, you can either carve the chicken into quarters or you can tear or shred the meat to make pulled chicken. Or, if you want extra-crisp skin, you can briefly roast the chicken in a 450°F (232°C) oven or prepare a grill for indirect cooking (with hot and cool sides), place the chicken over the cool side, cover the grill, and cook for 5 to 10 minutes. I chose to use the wonderful Fette Sau dry rub on my whole chicken because I was hoping to have a gorgeous, rustic smoked chicken. I was not disappointed. It was succulent, delicious, and smoky, the perfect combination. I used a bit over 1/2 cup dry rub. The recipe produces much more than that, but I was glad that it did, as I will be using the rub on many smoked meats in the future. I brought my smoker up to temperature and heated it for 30 minutes or so. Once I got the temperature stabilized at 225°F, I added the chicken. It took just about 5 hours for my 6-pound chicken to reach an internal temperature of 165°F. I like my skin crisp, so I finished the hen in the oven, as the recipe instructed at 450°F for about 8 minutes. I let the chicken rest for 10 minutes and then carved it. 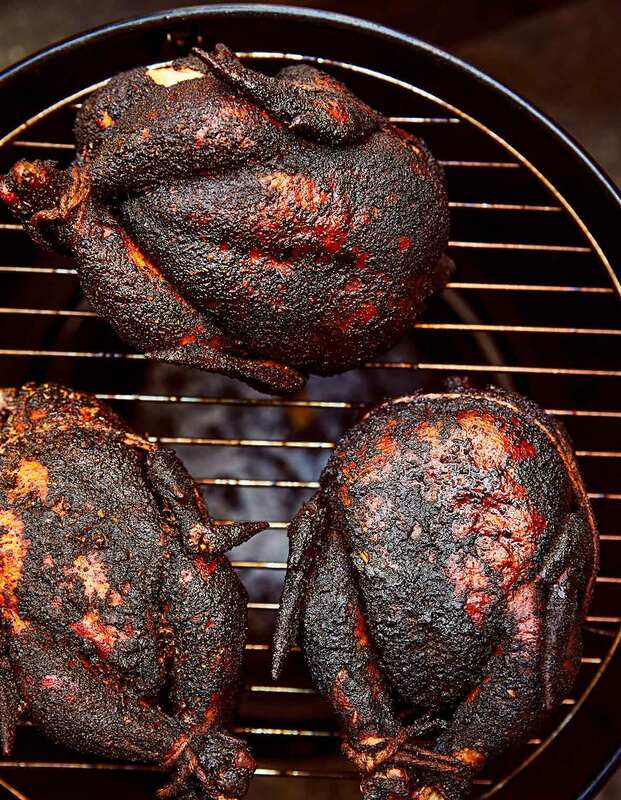 Smoked Chicken Recipe © 2015 Joe Carroll and Nick Fauchald. Photo © 2015 William Hereford. All rights reserved. All recipes and photos used with permission of the publisher.